The more sand contained within the a PC pump, the more likely the pump is to seize and the harder the rotor is to pull free. As sand and debris move through the pump, it can cause part of the rotor to “catch”. Then, with the torque applied from the surface, the rotor is twisted further into torsion and out of phase with the stator. Available torque is wasted when overcoming the resultant normal force (FN) between the rotor and the elastomer, and the probability of the rotor seizing within the stator increases with FN. 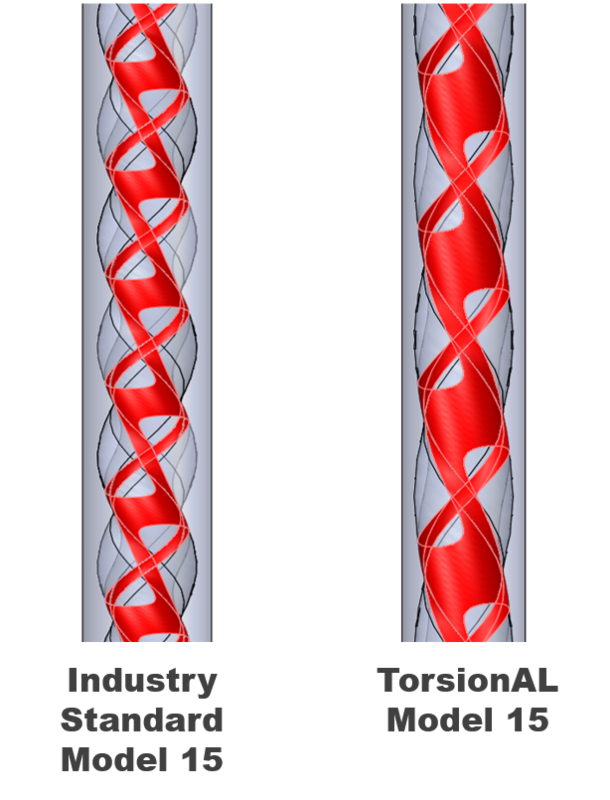 With the TorsionAL progressing cavity pump you can reduce torquing by reducing torsional deflection, increase ease of rotor pulls, and increase sealing surface area and longevity of seal. The TorsionAL pump can be combined with the Lifting Solutions PivotAL™ rotor to make a PivotAL 15-900x2, which is ideal for harsh or aggressive operating requirements such as sandy wells and new well completions. This product is currently in field testing. Contact us to learn more about the trial results or to participate in trialing this product.